Luckily, or unluckily, depending on your point of view Arthur's Pass and indeed the South Island has no volcanoes. In lieu of this we have an extreme number of active fault lines transversing the island, and with this a substantial amount of geo-thermal activity (hot springs). Arthur's Pass area has two such hot springs, Otehake and Julia Creek. Mts Tongariro, Ngauruhoe and Ruapehu are part of the Tongariro Volcanic Centre in the Taupo Vocanic Zone of the central North Island. Volcanism in the Taupo Volcanic Zone is the result of the subduction of the Pacific Plate under the Indian - Australian Plate. Ruapehu is an andesite stratovolcano 2,797 metres high. A small (0.2 square km) crater lake is at the summit. Numerous eruptions have occurred at Ruapehu since 1860, the most recent in 1998. Ngauruhoe is an andesite strato-volcano and rises 2,291 metres above sea level. Ngauruhoe has erupted about 50 times since 1839. The 1975 eruption was vulcanism, consisting of a discrete burst with ejected fragments of solid lava plug. Tongariro is also an andesite stratovolcano and erupted most recently in 1927. 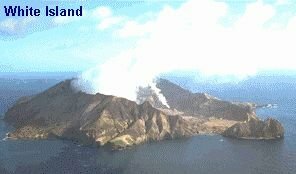 White Island is New Zealand's most active volcano. It usually just steams along, but sometimes larger ash eruptions generate a dark column over the island. It is privately owned, and you can get there by boat or helicopter. White Island has a central crater whose appearance is constantly altered by minor and major eruptions. There is always a cloud over White Island, but it is usually white (steam from sea water invading the crater and fumeroles) and its shape and size varies with the volcanic activity and the weather (the colder, the more steam you see). Mt Taranaki (or Mt Egmont) began forming about 70,000 years ago. By 35,000 years ago, a cone similar to the present mountain had formed. About 25,000 years ago, the northern part of the cone collapsed, generating lahars that travelled beyond the present coastline. This lahar deposit covers 200 square kilometres to a depth of at least 30 metres. The second major cone collapse and associated lahar deposit occurred between 16,100 and 6,970 years ago. The most recent major cone collapse was 6,970 years ago. It also produced a large lahar deposit. Taranaki has erupted at least eight times in the last 6,000 years. 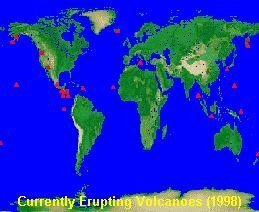 Most of these eruptions have been explosive and from the central vent. Two flank eruptions produced Fanthams Peak and the Southern Beehive about 1,300 years ago. The last eruption of Taranaki was in 1755. Mt Taranaki is merely dormant, its' ice clad peak does not mean it is dead. If you want a full Glossary of Terms used in Volcanology Click Here.